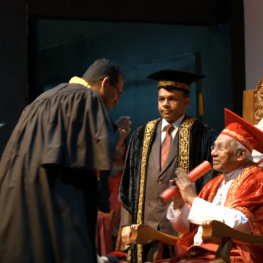 The University of Colombo School of Computing held its 14th convocation for the graduates of Bachelor of Information Technology – external (BIT) at the Auditorium of the University of Colombo School of Computing on 6th December 2017. The most rev. Dr Oswald Gomis, the Chancellor of the University of Colombo presided the meeting. UCSU took the initiatives to the external degree (BIT) or The Bachelor of Information Technology in 2002 by having the most advanced training resources and experiences in the field of ICT with the expectation of developing the human resources in Information and communication technologies.